This delicious tart has a tender gluten free crust and lightly sweetened almond filling. It highlights rhubarb’s gorgeous color, making it the perfect dessert to wow your family and friends! Before springtime officially comes to a close, I had to add at least one recipe using rhubarb, the beautiful and beloved springtime vegetable. It’s technically a vegetable, but most often used like a fruit—in pies, tarts, and other desserts. Rhubarb tastes very tart when raw, similar to green apples, but delicious and more mild when roasted and sweetened with honey or sugar. Unfortunately, it only has a short season, which spans from April to June, so you have to take advantage of it while you can, or at least store some in the freezer for future use. This tart has a gluten and dairy free crust, but if you’re not gluten-free, feel free to substitute a standard pâte sucrée in its place. 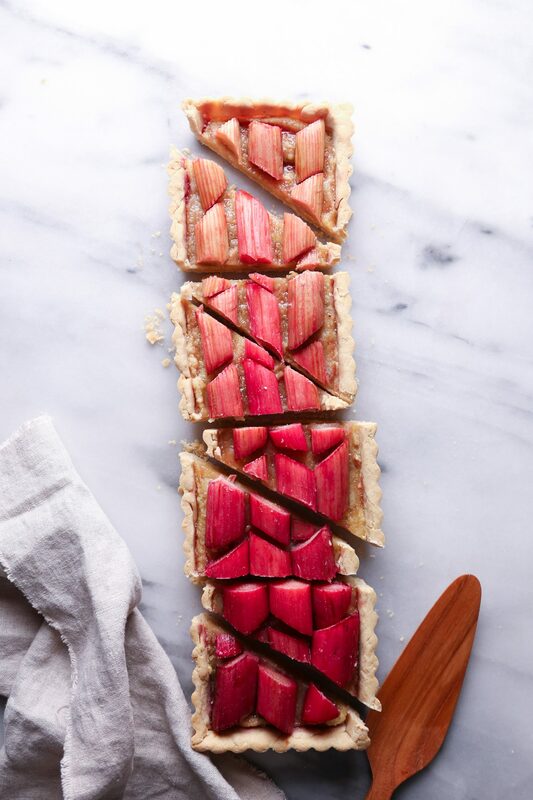 It’s filled with frangipane, a creamy almond flavored filling, and topped with fresh rhubarb and turbinado sugar. If you arrange the rhubarb slices from light to dark, it makes this beautiful ombré effect, which really adds a dramatic presentation, yet it’s so simple to do. I only began make tarts a couple of years ago, because they seemed way too difficult for the average home baker. It was one of those things pastry chefs made in fancy bakeries. I finally broke down and bough a tart pan because it was on sale, but it sat in my kitchen for probably a year before I actually used it. I was surprised to find that it was similar to making a pie, just in a different pan. It might be even easier than some pies because there’s not a top crust to have to fiddle with. This tart has a tender gluten free crust and lightly sweetened almond filling. It highlights rhubarb's gorgeous color, making it the perfect dessert to wow your family and friends! Preheat oven to 375ºF. For this recipe I used an oblong tart pan 13.75 x 4.25 . I recommend using the same size pan, but you could use a different size tart pan if necessary. Just keep in mind that bake time may vary. Place the flour, sugar, salt, and palm shortening into the bowl of a food processor and pulse until shortening is thoroughly incorporated and mixture is crumbly. Add egg and process until well blended. Add water 1 tablespoon at a time, until dough comes together and is no longer crumbly. Should be nice and pliable, not dry and crumbly. Let rest for 5 or 10 minutes. Place dough in between two pieces of parchment paper and roll a couple of inches larger than your pan. Use the parchment paper to invert dough into the pan. Carefully fit dough into the corners and up the sides of the pan. If the dough breaks just pinch back together. Fold in the extra dough to reinforce the sides. Trip the excess and discard scraps. Use a fork to prick the bottom of the dough. Place a piece of parchment inside and weigh down with pie weights or dry beans. Place tart pan on a baking sheet and bake for 10 minutes. Remove from the oven and let cool. Remove parchment paper and weights. To make the frangipane filling, melt butter and and stir in maple syrup/honey, almond flour, corn starch, pinch of salt, and vanilla. Continue stirring until mixture is well blended and smooth. Pour into the cooled crust and spread into the bottom evenly. Place rhubarb pieces on top of the filling in whatever pattern you'd like. Use lighter colored pieces at one end and gradually transition the color down the tart to get an ombré effect. Sprinkle a generous amount of turbinado sugar over the top of the tart. If you don't want to use turbinado sugar, you could use regular cane sugar or honey. Bake tart for 30 or 35 minutes, until rhubarb is tender and crust is lightly browned. Blend strawberry preserves with a splash of hot water. Brush strawberry glaze over the top of the rhubarb. Cut into slices and serve. Makes about 8–10 slices. *Others have said a chia egg works as a replacement (1 tablespoon ground chia seeds gelled with 3 tablespoons water) but I haven't tried it before so I cannot say for sure. An egg replacer (like Bob's Red Mill or Ener-G) may also work, but hasn't been tested. Please let me know your results if you use either of these methods! This is the cutest little tart ever! So photo worthy and I bet taste worthy too! YUUUMMMM! I almost picked up some rhubarb on my last market run but was like “idk what id make with it” I should have grabbed it! Thank you for the kind words! I hope you’re having a lovely week! This is beautiful and also looks so yummy!! Plus, it’s gluten-free, and I actually love rhubarb so I am soooo excited to try this recipe out! Pinned! Thank you Amanda! I really appreciate the love and support. Please let me know how you like it. Have a great week! OMG, I’ve never had rhubarb! I definitely need to find some and make this recipe this weekend! Thank you. Have a lovely week! This looks incredible! I have never tried anything with rhubarb, but this totally caught my eye and made me want to try it! Yum! Thanks Lauren! Have a great evening! I love tarts! This in every looks beautiful and tasty! I also never say no to almond filling. This looks amazing! I love the ombre colors and the fresh flavors! So creative! I`m not a rhubarb fanatic but this looks tasty- nicely done! This is SO cute! We bet it’s delicious too. your food is always SO pretty! I’m completely obsessed with rhubarb right now. It’s such a good tart to go with sweet! I definitely want to this beautiful tart! Thanks Lauren. Please let me know if you try it out! Wow, this is a gorgeous dessert! I’m ashamed to say that I’ve never had a rhubarb pie before!! I’ll need to try one! I don’t think I’ve ever tried rhubarb, but this pie looks delightful. Thank you Elizabeth. Have a lovely evening! Can you please send them to my house and I will be your BFF for ever? What a beautiful dessert. A very clever way to use the rhubarb stalk. I think the frangipane filling would be delicious with the tart rhubarb. Yes, it’s so delicious Gillian! It’s a nice balance. Have a wonderful week! Such a stunning tart, I love the ombre pattern! This looks so good! I love rhubarb. My favourite is strawberry rhubarb crisp. Beautiful photos! Strawberry rhubarb sounds so good. Thanks for your comment Mar! Okay you had me at almond filling not gonna lie all I could think about was the filling and how yummy the pictures look! Thank you Shauna! I appreciate the encouragement! OK, so this is beautiful. Absolutely stunning. I’m not normally a big rhubarb person, but I may have to make an exception for this. Plus it looks like it wouldn’t be too sweet, just something yummy. Hi Carrie, thanks for your comment! You’re right. It really isn’t too sweet. It came out just right. I appreciate the kindness!